New Year is essentially the ‘American Christmas’ of Russia. They put up a Christmas tree, receive presents from “Mr.Frost” (Santa), and spend time with family. Russian Christmas is celebrated on the 7th of January, although many still won’t celebrate unless they are religious. The week leading up to that date serves as a mini-vacation from December 30th-January 9th. The date is different because the Russian Orthodox church uses the old Julian calendar for religious celebration days. 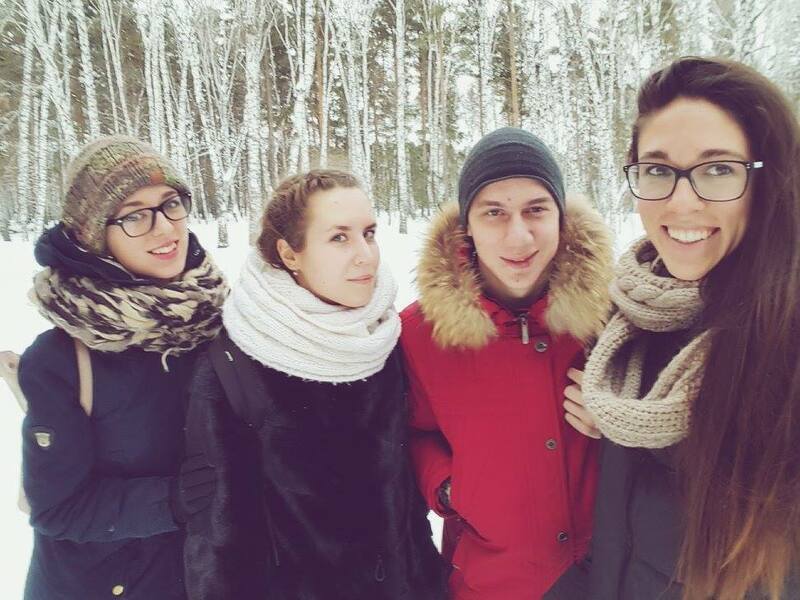 When I first moved here I was teased that I had no family in Russia and I would be lonely for New Year. But this thankfully deemed untrue. The holiday allows for 10 days of vacation and I was happy to explore a little. On the 31st, my colleague Vera invited me to her family member’s camp out in Berdsk, which is a city one hour South of Novosibirsk. I met up with her family member en route to Bersk. The car ride was silent but serene. 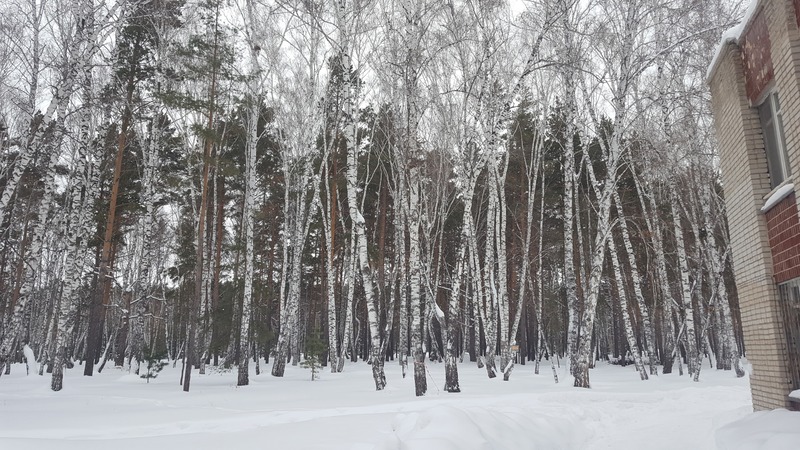 I listened to music and watched the thousands of birch and pine trees beautifully covered in snow out the window. We passed cities and houses and rivers. It was quite mesmerizing to watch. The ride took about one hour. We arrived and everything was immediately hectic. I helped them bring out chairs and tables from one room upstairs, downstairs, down the hall and then upstairs into another room. They had quite a bit of food for the party. 7+ chickens, tons of fish, candy, vegetables, cheeses of all types, baked sweets, pizza, and endless juice, champagne, and Olivier, which is a typical Russian New Year cuisine made from egg, boiled potatoes, dill pickles, peas, carrots, bologna, and dressed with mayonnaise. All directions were given in Russian, so I sat clueless and tried my best to help. We gathered together with the food and drinks. First, we watched the children put on a show. It was all in Russian, so I couldn’t follow too well. There was “wind” and fake snow and thermometers and aliens. Like I said, I couldn’t follow, but it was cute. When the children finished, the announcer called a bunch of people to the stage and they each made a toast for the New Year. Then, it was almost midnight. One guy had to take out his phone and show me the time so I could understand what was actually happening now. We started eating and broke out the champagne. They counted down in Russian and we all filled up our cups. Once everything settled, I was handed a napkin and a candle. They turned off the lights and played music. As I looked around for assistance, they explained that you have to tell someone something nice for the New Year and trade candles with that person. So we all gathered on the stage and told each other nice things. 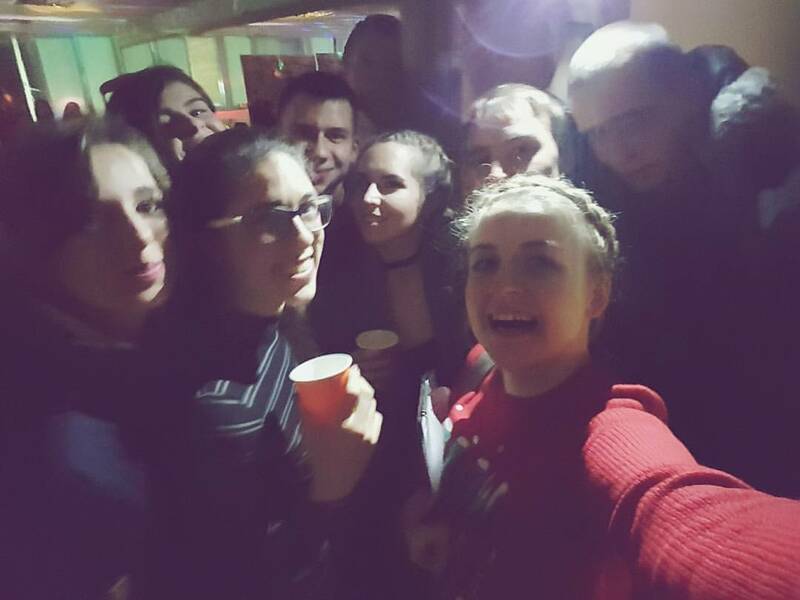 Some of the girls and guys that spoke English came up to me and wished me a great upcoming New Year. We went back to the tables, broke out champagne and everyone started dancing. They all knew dances to the Russian songs like we know for American party songs (like cha cha slide??) We danced/enjoyed ourselves/celebrated until the wee hours. The next morning, I walked around while everyone was still sleeping. I sat facing the window, and stared at the beauty outside. It had been snowing the night before and all of the trees were white. Then, once everyone woke up, it was time to eat leftovers and talk together again before leaving. They taught me Russian swear words, I learned that we had 3 boxes of champagne that weren’t touched yet, and that an empty rum bottle was found by a child near the children’s room. They were trying to solve the mystery of who left it in such a place! There was a giant bowl of Olivier salad left over(I wish I had a picture of how big this salad was) and everyone was happy to eat the rest. I left with four others around 3pm. One guy drove us in his car to the metro station and I was introduced to some Russian music. Here is a picture of one of the many signs up in Novosibirsk. “Happy New Year from Novosibirsk” (& the polar bears of course) !